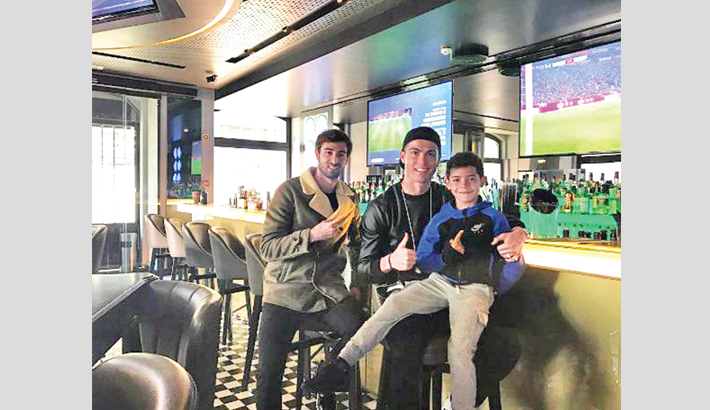 Portugal and Real Madrid star Cristiano Ronaldo, centre, pictured with his son Cristiano Jr during a breakfast. West Indies cricketer Chris Gayle poses for photograph in front of a Christmas tree on Thursday. France and Atletico Madrid footballer Griezmann, who stands at 5ft 9in, stands next to the tall basketball player Kristaps Porzingis (7ft 3in) in New York’s famous Madison Square Garden on Friday.